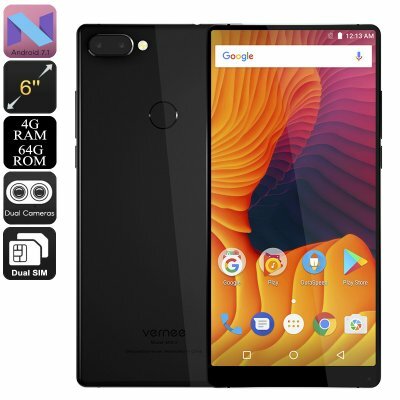 Successfully Added HK Warehouse Vernee Mix 2 Android Phone - Octa-Core, 4GB RAM, 6-Inch Bezel-Less 2K Display, 4G, Android 7.1 (Black) to your Shopping Cart. The Vernee Mix 2 Android phone is guaranteed to blow your mind with its absolutely gorgeous 6-inch bezel-less display. By bringing forth breathtaking 2K resolutions at 2160x1080p, this Android smartphone is sure to uplift your mobile entertainment experience to entirely new heights. If you enjoy playing games or watching movies on the go, this latest Android phone is perfect for you. It comes with 64GB internal storage and a whopping 128GB SD card slot. Therefore, you never have to worry about storage space for all your files and media. With its Android 7.1 operating system, this bezel-less smartphone delivers a smooth user experience. You’ll be able to tackle the latest software features and Applications without ever encountering any delay. The phone furthermore treats you to Dual-IMEI numbers for increase connectivity. By supporting 4G mobile networks, it allows you to enjoy the fastest mobile data speeds available no matter where you’re at. With the Vernee Mix 2 Android phone at your side, you will always stay within reach to friends, family, and colleagues. An absolutely massive 4200mAh battery delivers an unbelievable 20 hours of continuous usage time. It furthermore allows you to keep your phone on standby for 9 days without needing to recharge. All this power keeps the phone’s powerful hardware running throughout numerous days. With an Octa-Core processor and 4GB RAM in place, this latest Android phone can tackle the most demanding Apps without dropping a frame. The phone even comes with a 13MP Dual-Rear camera and 8MP front snapper for all photography and selfie-lovers among us. No matter your smartphone demands, the Vernee Mix 2 is sure to meet them all.